A popular herb in the Cape, Ballota africana is easy to identify by its soft-grey, aromatic foliage and old brown calyces that remain long after the flowers have lost their colour. Ballota africana varies in height from 0.3 to 1.2 m tall. Along the West Coast, within reach of the cool sea breeze, kattekruie can grow into tall sturdy bushes, whereas in the hot Little Karoo the plants tend to be much smaller, growing in the shade of other bigger shrubs. Typical of the family Lamiaceae, the stems are square-shaped and the leaves are formed in pairs opposite each other. Both the stems and leaves are covered in short, white hairs, which give the plant a grey colour. The soft grey or green leaves are round to heart-shaped and can give the impression of drooping because they point downwards. The edges are toothed and the surface of the leaves is very uneven with strong lines and wrinkles formed by the veins. When the leaves are squashed they give off a pungent smell. 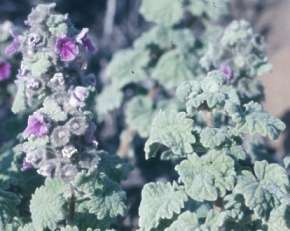 The pink to purple flowers are formed in dense whorls along the tip of the stems. The green, hairy calyx that holds the colourful petals is the more prominent part of the flower and remains after the smaller petals have fallen. The old brown calyces that remain in small clusters down the stem make the plants easy to identify even when not in flower. The main flowering season is from late autumn to early summer (May to November), with a peak in spring. Ballota africana is the only species of Ballota in South Africa. It is most common in the more arid, winter rainfall areas of the Cape. 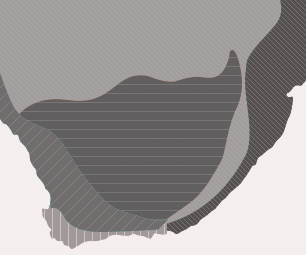 Its natural distribution stretches from the southern part of Namibia down to the West Coast and Cape Peninsula, throughout the Little Karoo and further along to the Eastern Cape and Free State. Along this wide distribution Ballota africana is usually found along streams, in the shelter of rocks and bushes, and as a pioneer in disturbed places. There are 33 species in the genus Ballota that are mainly distributed around the Mediterranean and Eurasia. In Africa, four species are found in Ethiopia-Somalia other than B. africana which is indigenous to South Africa. 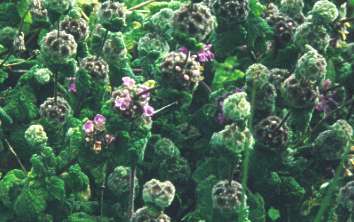 The genus name Ballota is derived from ballote, the ancient Greek name for Ballota nigra, which is commonly known as black horehound in Europe. Smith (1966) gives the following explanation for the Afrikaans common name, kattekruie, 'the name is applied in Holland for Nepeta cataria and was transferred from this to the Cape plants, probably in very early days, no doubt from some resemblance between the flowers and smell'. Economic and cultural value The use of Ballota africana as a medicinal plant has a long history at the Cape. The Khoi and Nama often used the leaves in combination with Salvia species, for fevers and measles. Africans used it for relieving severe colic and as a snakebite remedy. Other than learning from the local Khoi, the early colonists must have recognized the similarity between B. africana and the closely related European herb, B. nigra. In France, B. nigra was used for insomnia and coughs, while in England it was used as an antispasmodic, stimulant and vermifuge. 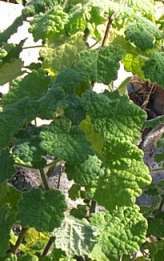 Traditionally, fresh or dry, the leaves of Ballota africana were used as a tea to treat coughs, colds, sore throats, influenza, asthma, bronchitis, colic, typhoid fever, hysteria, and over-excitement. Margaret Roberts still recommends it for the treatment of coughs and chest conditions. She gives a recipe for a cough syrup in which she boils brown sugar, cloves, lemon juice and water with a few sprigs of kattekruie (Roberts 1990). The traditional use of making a brandy tincture with Ballota africana is still popular today, especially for the treatment of haemorrhoids. A single tot taken in the evening is said to be good for colds and influenza, asthma, bronchitis, hoarseness, heart trouble, hysteria, insomnia, typhoid fever, headaches, liver problems, piles and as a foot bath for arthritis (Van Wyk et al. 1997). Ballota africana must be one of the first indigenous plants involved in a court case in South Africa. Pappe, a physician and botanist at the Cape, recorded a trial in 1838 in which B. africana was presented as a narcotic (erroneously) and used in the proceedings against the accused, C.A. van der Merwe for the murder of his wife. (Watt & Breyer-Brandwijk 1962). In spite of its bitter taste, there is however no record of B. africana being poisonous. On a lighter note, children along the West Coast used to dance around the plant, singing 'kattekruie, kattekruie, daar staan die kattekruie, dis 'n lekker kruie'. The song translated means, 'kattekruie, kattekruie, there is the kattekruie, what a lovely herb! At Kirstenbosch, Ballota africana is grown in the herb garden and peninsula section. It grows best in full sun to semi-shade and good drainage is essential. New plants are propagated from cuttings, which root within two to three weeks. The cuttings should not be kept too wet if they are placed in a mist unit. B. africana can also be grown from seed, sown in spring or autumn. In the wild, small seedlings are commonly found around the mother plants. Ballota africana is a valuable herb and a pretty perennial for indigenous, especially dry gardens. Codd, L.E.W. 1985. Lamiaceae. Flora of southern Africa 28,4. Botanical Research Institute, Pretoria. Leistner, O.A.(ed.). 2000. Seed plants of southern Africa: families and genera. Strelitzia 10. National Botanical Institute, Pretoria. Roberts, M. 1990. Indigenous healing plants: 110. Southern Book Publishers, Halfway House, South Africa. Smith, C.A. 1966. Common names of South African plants. Memoirs of the Botanical Survey of South Africa No. 35:285. Van Wyk, B., Van Oudtshoorn, B. & Gericke, N. 1997. Medicinal plants of southern Africa: 54. 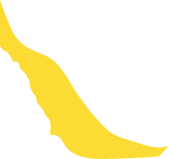 Briza Publications, Pretoria. Watt, J. & Breyer-Brandwijk, M.G. 1962. Medicinal and poisonous plants of southern and eastern Africa: 514. Livingstone, London.